Does a frozen candle burn faster than a room temperature candle? Answering this question is a great project for a science fair. Does a Frozen Candle Burn Faster than a Room Temperature Candle? The identical candles are very important to the experiment. You want candles that burn at the same rate to begin with. The first step of any experiment is to create a baseline for your hypothesis. If you believe a frozen candle will burn faster or slower, you need to know at what rate the candles you are experimenting with will burn. Create your baseline. Light two of the identical candles at the same time. Be sure to place them in an environment where they are not affected by environmental drafts that will affect the burn rate. Record the time the candles are lit. Allow them to burn until they go out on their own. You may record with a video camera for accuracy. Both candles should burn an equal length of time. Once you have established the amount of time it takes the candles to burn, you are ready to go on to step two. Take one of the two remaining candles and freeze it. It is important to recognize that the thicker the candle, the longer it may take to freeze. If you are using an exceptionally fat candle, you may want to leave it in the freezer for 36 to 72 hours to be assured of the center freezing on the candle. If the center is not frozen, then the interior of the candle will burn at a different rate from the exterior of the candle and cause problems with the efficacy of your testing. You are now ready to test your hypothesis. Does a frozen candle burn faster than a room temperature candle? Burn your frozen and room temperature candles in the exact place and environment that you burned the test candles earlier. By matching the environment to your established baseline, you are further preserving the integrity of your test. Remember to record the time elapsed and any observations you make of how the two candles burn. You may wish to record the experiment for later review. Some candles can take several hours to burn, recording will also allow you to conduct your experiment even if you have to go to sleep. Compare the elapsed time of burning for each candle and record your results. You may then present the information at your science fair or class. 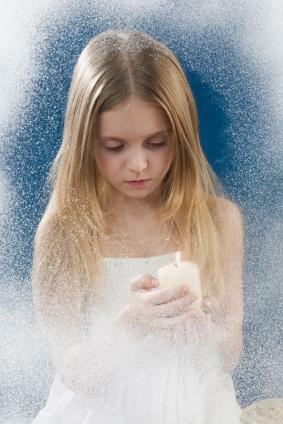 Typically, a room temperature candle will burn faster than a frozen candle. A rate of burn is determined by the wick effect. The flame heats the wax beneath the wick, pulling the wax upwards along the wick to provide fuel. The heat evaporates at the top of the flame. Wax that is frozen takes more energy to heat and melt, thus slowing the rate at which the wax is consumed. If your results are different, check the testing method and types of candles you used. However, experiments do not always provide the exact same results. The point is to test the efficacy of your own findings. If you performed the experiment and verified each step, then you still have a science project. You can even include your own observations and hypothesis on why your results were atypical.